In the late 1990s and early 2000s, the landscape of television began an unprecedented transformation. No longer necessarily concerned with creating always-likable characters, plots that wrapped up neatly every episode, or subjects that were deemed safe and appropriate, shows such as The Wire, The Sopranos, Mad Men, Deadwood, The Shield, and more tackled issues of life and death, love and sexuality, addiction, race, violence, and existential boredom.This revolution happened at the hands of a new breed of auteur: the all-powerful writer-show runner. Combining deep reportage with cultural analysis and historical context, Brett Martin takes us behind the scenes of our favorite shows, delivering never-before-heard story after story and revealing how cable TV has distinguished itself dramatically from the networks, emerging from the shadow of film to become a truly significant and influential part of our culture. Difficult Men definitely lets you know what it’s all about with its title, but I still wanted something a little different that what Martin delivered. I think I wanted more about the complex characters of Tony Soprano (The Sopranos), Don Draper (Mad Men), and Walter White (Breaking Bad) themselves and their cultural impact. 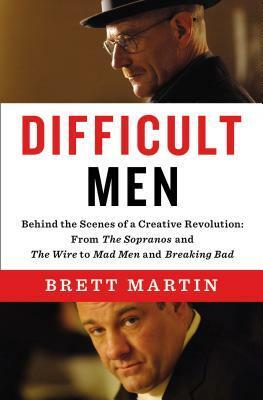 Difficult Men is mostly about David Chase and behind the scenes of The Sopranos, which of course I enjoyed learning about, as well as how James Gandolfini handled (or rather, struggled with) his iconic role. I guess I expected a broader look at what Martin calls the “Third Golden Age of Television.” Martin gives short shrift to regular network shows (no love for Lost?? I loved that show) and you don’t read much about women in the business here (well, that could and should be a whole book unto itself). The process from writing to production was really interesting, as well as how the show runners were given freedom to see their vision through and push the boundaries of televised storytelling thanks to the development of the 60-minute episode and 10–13 episodes-per-season format. It’s worth a read if you want to know more about the background of The Sopranos for sure, and some background on a few other revered cable dramas. Listened to audiobook in August 2017. This entry was posted in books and tagged american history, audiobook, drama, history, non-fiction, pop culture, television by kristin @ my little heart melodies. Bookmark the permalink.